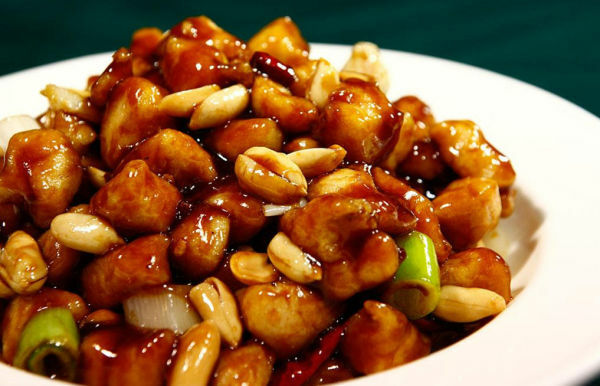 Chinese stir fried chicken cashew nuts (or “kung pao chicken”) is a popular dish in China and a particular favourite of these two greedy boys. It has become a popular Chinese food in Western Chinese take aways. It originated from the Sichuan province in China and ideally uses the popular (and spicy) Sichuan peppercorns. As with all Chinese dishes, this is best served with rice. Heat empty wok (without oil) on a high heat. When you see smoke coming out of the wok, add oil and lower the heat. Add garlic, ginger and chicken and a pinch of pepper and stir fry on a low heat until chicken is white and cooked. Add the vegetables (carrots, garlic stalks, pepper and ginger) and then a pinch of salt then stir fry on a high heat for a few minutes until vegetables soften. Add water (do not yet stir) and turn to high heat then add the oyster sauce. Only stir once water has started bubbling as otherwise this will negatively affect the flavour. Add cashew nuts and mix, then remove from heat and serve.